I’m on a super ferry! Super ferries are like regular ferries, only more super. One of the things that makes them so super is that they have wifi! Squee! Of course, now that I’m on the super ferry with its super wifi, I realize that I don’t have a heck of a lot to blog about! Since our epic tackling of Mount Baldy, we’ve been enjoying some R&R. 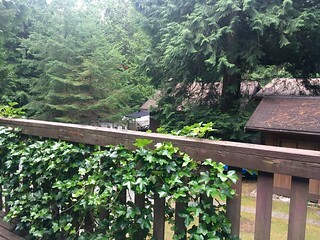 Mostly just relaxing and hanging out – and I’ve been doing a bunch of school-related reading1. I’m at the point that I’m sufficiently freaked out by the amount of homework I have to complete before September, so I’ve done a fair bit of reading over the last few days2. The extremely hot weather3 has leant itself to a lot of sitting on patios reading, as it’s a bit too hot to do anything too strenuous4. And seriously, who doesn’t love sitting on patios enjoying the sunshine and a fine beverage? Right now, we are heading back to the mainland, where we will crash at home for the night, and then head up to the Okanagan. The plan for the Okanagan is lots of swimming, hiking, visiting wineries, and playing with Devon’s wee niece. With any luck, we’ll spot Ogopogo – or at least get some Ogopogo’s Lair! Look at me, I’m on the ferry! And I’m typing on my laptop, which is tethered to my iPhone! All praise Steve Jobs! I was pretty happy to have gotten on this 5 p.m. ferry, since the workshop I was at in downtown Victoria ended at 4 p.m. and I wasn’t sure I’d make it to Swartz Bay in time for the 5 p.m. sailing. 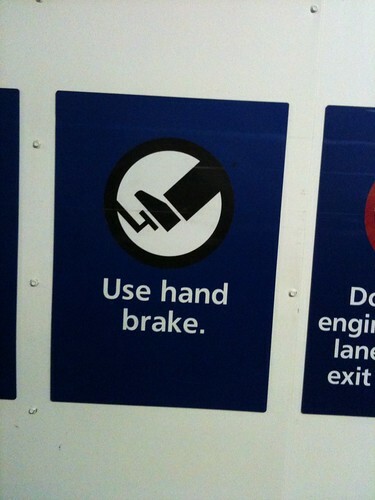 Especially after seeing the traffic going into Victoria this morning. 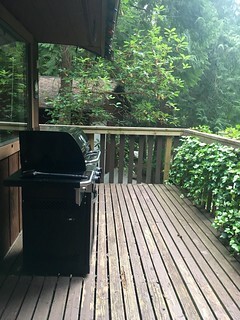 I’d come over on the ferry last night and stayed with a friend in East Sooke last night… a friend I’ve known since kindergarten (!) but hadn’t seen since high school (! ), which was super awesome. When we were little, I used to sleepover at her place out in the country and now she lives out in the country again – so it was just like old times. Well, except on the other side of the country. And we had 15 years of life to catch up on! And there’s the announcement telling us we are almost to Vancouver, so I better pack up my stuff and get back to my car! 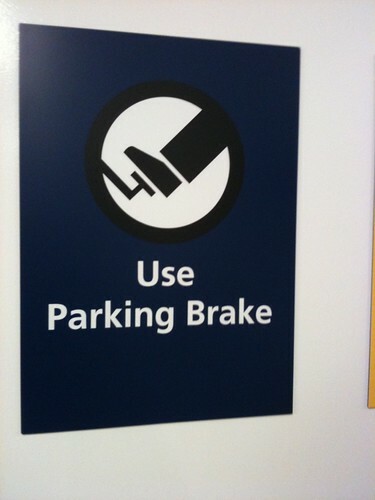 Use Hand Brake. Or, Whatever. So this past weekend I was out having so much bloggable fun that I never got around to blogging it. Until now. Which is Wednesday. Saturday involved Kalev and I going on an epic road trip to the Albion Ferry. For anyone not from the Lower Mainland, I shall explain what the Albion Ferry is (which should give those of your who are from the Lower Mainland enough time to recover from laughing at the thought of the Albion Ferry being thought of as a tourist destination). The Albion Ferry is essentially a commuter ferry that brings people across the Fraser River from Maple Ridge to Fort Langley. 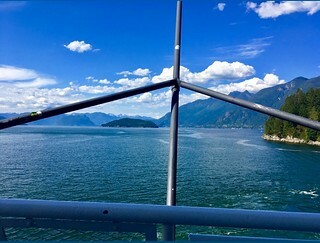 The ferry ride itself is just a few minutes, but you often hear of 3, 4 or more sailing waits (and with each sailing being 15 minutes apart, that can be a substantial amount of time sitting in your car waiting for a few minutes on a boat). So they are building a bridge – The Golden Ears Bridge – which has been under construction since June 2006 and which will be ready in about two weeks, so that people in that area can just drive over the river whenever they feel like it. And thus the Ferry is being retired next month. Hence the road trip. Kalev and I felt it was our civic duty to have taken the Albion Ferry at least once before it is shut down forever. 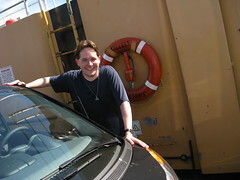 I’m pretty sure Kalev and I were the first ever tourists on the Albion Ferry. Did I ever mention that I frickin’ love my car? From Kalev’s, we headed out on Highway 1 and were chatting so much we totally forgot that we were supposed to get off the highway at the United exit. Which super duper sucked because it meant we had to go over the Port Mann bridge, then turn around and come back. And the Port Mann bridge coming back was at a standstill. So we sat ont he Port Mann for about 30 minutes when we really didn’t need to, seeing as we never meant to go over it in the first place! Good thing we weren’t in a hurry! 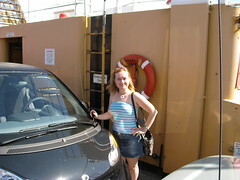 Proof that Kalev and I did, in fact, get on the Albion Ferry! After the brief trip across the water, we checked out the quaintness that is Fort Langley. I have a theory that all quaint towns are legally required to sell fudge. Ft. L. did not disappoint. And then it was on to The Olive Garden for dinner. The choice of restaurant was on Kalev’s insistence, as I maintain that the O.G. is white trash fine dining, but I do concede that the salad and breadsticks are tasty. Also, the eggplant parmigiana was far more deep fried than I had anticipated. 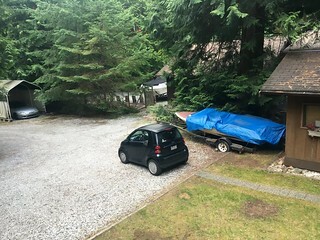 I mean, I know my smart car is little, but you could easily have fit two of them in that spot – three if you’d parked them sideways! After stuffing ourselves at the O.G., we decided to head home and on the way discovered a real, honest-to-goodness Baskin-Robbins store so, of course, we couldn’t resist the temptress that is Chocolate Mousse Royale ice cream. And that, my friends, is how I spent my Saturday!